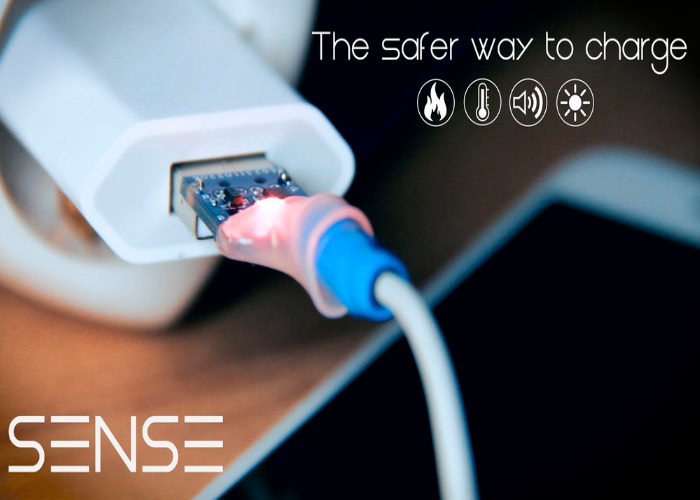 A new USB cable has launched via Kickstarter this week called Sense, specifically designed to reduce the fire hazards associated with charging your smartphones and tablets. Designed by a team of engineers based in Gjovik, Norway Sense provides a safer way to charge your devices with extra peace of mind by continually monitoring the temperature in the charger and device. If Sense sees the temperature is getting too high either through the cable or from your device it will automatically stop charging and set off an alarm to notify you of any discrepancy in the charging procedure. Watch the demonstration video below to learn more about the Sense charging cable which is launched via Kickstarter this week. Our mission is simple; we want to reduce the potential fire hazard involved in charging our devices. Our solution is to constantly monitor the temperature in the charger and phone/tablet, and if the temperature gets too high the SENSE cable will stop the charging and set off an alarm. Just plug in the cable and connect it to your device as you normally do, and that’s it. The SENSE cable will automatically perform a self-test each time it is plugged in and will notify you that it is monitoring the temperature. No buttons, no setup, just safer! The SENSE cable will fit your standard USB wall charger, and is compatible with most of the smart phones and tablets used today. If your device supports USB Micro, USB Type C or Apple Lightning (MFI certification pending), you are good to go! We are using high quality electronic components together with 1.8 meter (6 feet) of AWG20 wires to ensure proper charging of your device. Since this is a safety product, we have decided that every single unit will be tested before leaving the factory so you can rest assured that your unit works as expected. Working with local partners during development and manufacturing ensures faster production and shipping. We aim to start shipping the first cables in December 2017. The SENSE cable design is finished and we have a functional prototype and CAD design for the design. We need funding to pay for tools for final assembly and casting tools for the overmolding. The Apple Lightning connector is subjected to the MFI-program (Made for iPhone), and the use of the connector in our product is subjected to a certification process, thus the exact shipping date for the Apple Lightning version of our cable is hard to pinpoint. More details on the Sense USB charging cable jump over to the official Kickstarter campaign page via the link below where a number of pledges are available and shipping expected to take place during January 2018.